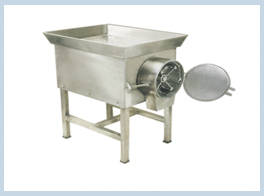 This compact unit is specially designed with high torque continuous duty motor to meet the grinding fineness required by Hotels, Hospitals, Restaurants, Large scale Canteens, Caterers and other Industrial units. With its swinging hammer rotating at 3000 Rpm against chamber of fine edged teeth will grind anything and everything right from wet and hard dry materials. Its compact size requires very little space which makes complete business sense. Material of construction is Stainless Steel. It is easy to operate, special set of mesh for various material is provided for grinding from coarse to fine. Silent performance with low power consumption. Available in different sizes for different needs: 2 Hp, 3 Hp, 5 Hp and 7½ Hp Motor.